BelarusDigest > Myths > Do Belarusians have a weak national identity? Do Belarusians have a weak national identity? Indeed, Belarusians have a lower level of consciousness about their national language and history than most of their neighbors. Several reasons explain this. Belarus (called Belarusian People’s Republic) first declared independence on March 25 1918 under the German occupation. 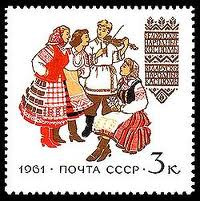 However, independence lasted only several months until the Soviet Socialist Republic was proclaimed. Belarus’ human and material losses were tremendous during both the First and Second World Wars. In 1939, much of Western Belarus constituted a part of Poland. Coupled with the intense Russification during the Soviet times, these realities have left Belarusians with a very specific legacy. Belarusians are highly risk-averse and obedient. They learned to be content even with the most basic freedoms, which look like luxuries after the years of war and brutal Soviet repression. The lack of strong national identity contributed to Lukashenka’s ability to manipulate public opinion in a highly atomized Belarusian society. It also contributed to Russia’s strong influence – ideological, political and economic – over the situation in Belarus.